This is what the garden looks like this morning. ?It’s just gorgeous and I am thrilled with how well it’s survived a cold, wet miserable time. ? Who knew this was the long weekend. We are so used to the 24th of May being our day for putting out containers and tarting up the garden with annuals. But here we are a week early. Keep the plants off the ground and wait a few days if you are in Southern Ontario. There will be frost tonight in all sorts of places. ? I’m going to be on Fresh Air (CBC 99.1 fm) tomorrow between 8:30 and 9. ? ?And if you would like to have the spring e-letter let me know.? Thanks for your?comments?Yvonne (she has a fabulous) garden. ?Haks are great plants and they have about 2 days of down time in the whole year. The garden has finally dried out and I’m pacing around trying to find spaces for all the new plants I seem to have stumbled upon in various nurseries. I was at Humber with my friend Susan yesterday: ?we managed to find so much stuff I thought we’d never get them into her car. But one skill all gardeners learn is how to load a car efficiently. Amazing stuff. Humber Nurseries has a superb collection of annuals. Wow, don’t miss any part of it and use your imagination in looking at the greenhouse section; ? Fiesta Gardens still has one of the best selection of perennials I’ve seen this year. Margaret Serreo is al ways just slightly ahead of the pack; ?but don’t ignore what’s going on at Loblaw’s and some of the other big box stores. But in the latter get them fast, maintenance falls off in a few weeks.? I was buying a few things for myself but mostly for clients. ?Combinations I adore and hope they will too. ? One that really gets to me is a heucheras with spikey plants such as Cordylines and something fluffy like a Hakonochloa. ?And certain Ipomea ‘Blackie’ spilling out of the side of a container. ?I will wait a few days to get this stuff in. ?But where I’m putting things is a bit of a mystery. An outside eye always makes a difference in the garden. ?Susan said “Why have you got all those Pulmonarias taking up so much space? 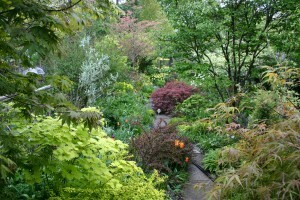 Move the spring plants to the back like they do at Great Dixter.” ?So we did. ? ?It makes a huge difference and of course there’s more room for new plants. ?In the shot of the garden today you can see a gorgeous little ?silvery Salix which ?has long been obscured by Physocarpus ‘Diabolo’ but ?Kathy whacked it right back and it seemed to open up the whole garden. I’m now thinking of getting about 8 people to help me get the gigantic grass out now. Every plant has its day in the garden and I’m getting tired of the same old profile. ?Gardeners need change. I’m also going to stop blogging until August. I’m supposed to be writing THRIFTY: LIVING THE FRUGAL LIFE WITH STYLE. ?I’ve got to get to it full time and right now my life is full of distractions from clients to the garden itself. So blogging’s out. I’ll change the picture of the garden on a regular basis. And I will do a monthly newsletter (well e-letter) about what’s important. ?Just sign up and we’ll send it to you.? I love doing this but time is my enemy at the moment and I’m sure you’ll understand. Today on Fresh Air, you mentioned a plant that is related to Jack in the Pulpits. Could you please send me the name of the plant. I think it might do well in our shady garden. We already have some Jacik in the Pulpits & other native woodland plants. That was Arisaema sikokianum a showier form of our native Jack in the pulpit: A. triphyllum. I love this plant and it will spread but in a woodland I can think of nothing better. The exotic forms are magnificent but get them away from the Jack: he moves too quickly. I do use rock and pea gravel. The rocks as big as possible (you might have a few around) and 3/4 inch pea gravel so it doesn’t migrate too fast. It will disappear. Worms move everything. I just signed up for your newsletter Marjorie. I am so going to miss Gardening Life. I just want to congratulate you on what an excellent job you and the entire team at GL did. Loblaws had some excellent selections over the long weekend and I stocked up on a few. I’m trying the small butterfly bush this year and one of the cityscape hydrangeas. I’ll probably pick up the twist n shout hydrangea too, because I just can’t resist. Have a wonderful summer and enjoy those lovely gardens.